Store signs (招牌) in ancient China started to become common during the Song Dynasty (960-1127). By the time of the Ming (1368-1644) and Qing (1644-1911) dynasties, stores had developed several types of signs to establish their identity. The first store signs consisted of a simple piece of cloth with some Chinese characters which was hung in front of the door. Often, only “tea house”, “restaurant”, or “drugstore” was written. Sometimes the name of the shop or shop owner was written instead. Another type of shop sign displayed a sample of the product being sold. For example, a shoe store might hang a shoe from a pole or a tobacco store may have a large wooden model of a tobacco leaf. Yet another type of store sign that became popular was totally independent of the line of business and relied instead on symbols of “good luck” and “prosperity”, such as ancient Chinese coins or the image of the “God of Wealth” (caishen 财神). China still retains some of these old sign traditions although they are getting more and more difficult to find among the glitter and clutter of the modern signage now common in the large cities. The sign at the left is located on a small side street in the city of Luzhou (泸州) in Sichuan Province (四川省). Luzhou is an old city famous for its liquor and spirits. This particular sign does not identify the name of the store nor does it reveal the line of business but instead expresses a wish for prosperity and good luck. Strung together are three large coins which decrease in size from top to bottom. These round coins with square holes in the center look exactly like the ancient bronze and brass “cash” coins that the Chinese used for more than 2,000 years. Interestingly enough, the “coin” in the middle has a traditional Chinese charm inscription. The inscription reads shou xi fa cai (寿喜发财) which translates as “longevity, happiness, and make a fortune”. 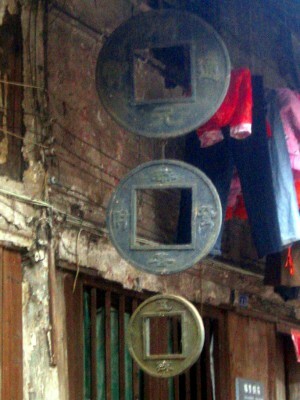 Although traditional store signs with the ancient Chinese coin theme are gradually disappearing, the modern era now allows for this symbol of good luck and wealth to be displayed in a new way. The modern building at the left is shaped like a stack of ancient Chinese cash coins. 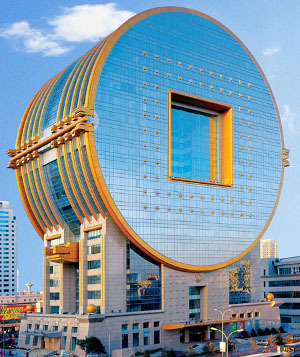 The 25-story Fang Yuan Building (方圆大厦), which was completed in 2001, is located in the city of Shenyang (沈阳) in Liaoning Province (辽宁省). The building was designed by the renown Taiwanese architect C.Y. Lee who also designed the “Taipei 101” (台北101) skyscraper which from 2004 to 2010 was the tallest building in the world. Though on a far grander scale, the Fang Yuan Building continues the tradition of hanging a sign consisting of ancient Chinese coins over the front door in order to welcome customers and bring good fortune.